Put your confidence in a service in Christchurch with a customer satisfaction rating of over 96%! A: We can swiftly remove stains with either outer window cleaning (for four-storey properties), rope access window washing (for high-rise properties), or via the usual manual cleaning of interior windows. Q: Can you share with me a bit more about your water-fed rod cleaning technique? A: Certainly! This gear can extend up to 22 metres in length, allowing the team to effortlessly reach and clean even the farthest corners of your panes. A: Our water is purified from any residue-causing minerals. When this fluid evaporates under the sun, it won't leave any smears behind. A: Rainwater is usually dirt-free, so it won't deter us from doing our responsibilities. However, while we won't be bothered by a slight shower, a sudden downpour can lead to unsatisfying results. During thunderstorms, we may have to delay our service for a day of your preference to ensure the technicians' safety. Q: Do I need to wait in my premises until the service is finished? A: No, the trained window cleaners in Christchurch can easily perform outer window cleaning in your absence, as long as your property gates are unlocked. And if you want your windows to shine on the inside, just book our free key pick-up and delivery option instead. Q: Do you polish window frames and sills? A: Yes – we will wash your PVC or UPVC frames and sills free of charge! With our window cleaning in Christchurch, you get a quality wash of your sash windows, skylights, conservatory roofs, French doors, and other glass surfaces at modest rates. We will even offer a free wash of all PVC & UPVC window elements! For a full list of our prices, please view our price table below. According to your needs, our window cleaning Christchurch can provide you with three choices. If you opt for outside cleaning, the experts will utilize a special water-fed pole. 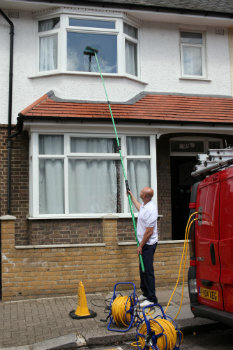 This cleaning tool can extend up to 22 metres in length, which is comparable to the height of a four-storey premises. The Christchurch window cleaners will use distilled water under high pressure that will rinse away all stains in almost no time. If you run a high-rise property instead, then opt for our rope access window cleaning. There, a team of certified climbers will methodically polish your windows until they witness the image of the setting sun. For your peace of mind, we check the cleaning equipment on a day-to-day basis and can offer COSHH records at your request. For in-house cleaning, the specialists will use ladders and squeegees to ensure that even the highest places will get proper treatment. Do any of your family members need help with washing away persistent window streaks? Keep on reading to learn which districts the Christchurch window cleaners can cover. Another quick and easy way to get a free instant quote or to book window cleaning services Christchurch DA16 is through our web site.